Few destinations offer as much of an immersive experience into the rich heritage of First Nations culture as does Vancouver, Canada. While Vancouver is well-known for its friendly citizens, diversity, extensive art scene, a variety of restaurants and incredible coastal scenery, which includes lush rainforest and mountainous terrain, it’s also the traditional homeland to the Musqueam, Squamish, Tsleil Waututh and Coastal Salish peoples. First Nations culture is interwoven throughout everyday life in Vancouver. From art installations, dual signage and dedicated museums to indigenous cuisine and First Nation-led excursions, this is a city overflowing with special, one-of-a-kind opportunities to learn about the indigenous peoples of the Sunshine Coast. "Indigenous people, the first hosts of this great city, share culture, history and friendship via walking tours, food, song and dance," explains Candace Campo, member of the Sechelt Nation and owner-operator of Talaysay Tours, a First Nations-owned company that offers authentic Aboriginal cultural and eco-tourism experiences in and around Vancouver. 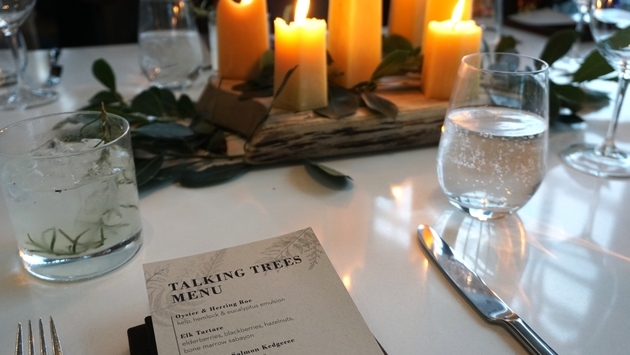 Visitors looking for both luxe accommodations and an authentic experience can book a Talking Trees Package with the Fairmont Waterfront, a certified 5 Green Key and soon-to-be Zero Waste property, which includes a Talking Trees Tour from Talaysay Tours. During this special tour, you’re accompanied by a local First Nations guide who leads you on a cultural, historic and scientific exploration of the trees and plants of Stanley Park. It’s fascinating to hear first-hand how they—to this day—continue to gather and harvest the very same plants for food and medicine that they have for centuries. Get ready to be blown away by First Nations’ in-depth knowledge of the nature that surrounds you and delighted by the stories that each tree and plant holds in their culture. And don’t miss out on the towering totem poles scattered throughout the lush park. In addition to this tour, the Fairmont package features a special indigenous-inspired dinner in ARC, the property’s upscale waterfront restaurant helmed by Executive Chef Anthony Marzo. This special dinner incorporates the foraged local bounty that was learned about on the tour. Our menu included dishes such as oyster and herring roe with kelp, hemlock and eucalyptus emulsion and elk tartare with elderberries, blackberries, hazelnuts and a bone marrow sabayon. 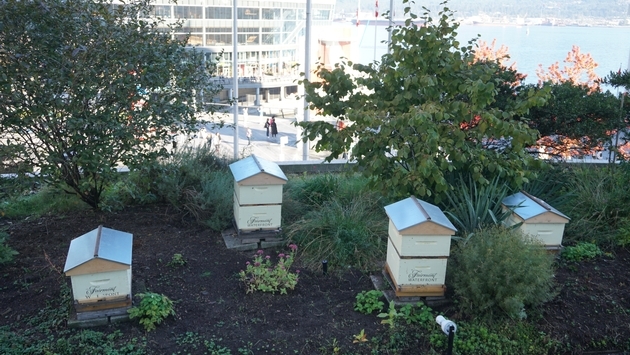 Before you check out, be sure to stop by the Fairmont’s newest addition to their impressive organic rooftop culinary garden—the West Coast Garden—which was designed in partnership with Campo and Hives for Humanity. This bountiful garden is overflowing with plants and flowers that provide food for bees and other pollinators. The garden includes the indigenous plants mock orange, salal, snowberry, salmonberry, deer fern, wild strawberry and Solomon’s plume. Much of what grows on the roof finds its way into the cuisine at ARC. If you’re craving more First Nations flavor, visitors can dine at Salmon n Bannock, Vancouver’s only First Nations restaurant, which specializes in wild fish, game meat, and you guessed it, bannock. From wild sockeye salmon and wild boar to more rarely tasted meats such as sea lion and oolochan fish, Salmon and Bannock uses traditional ingredients and prepares and presents them in a modern way. For a more casual take on First Nations food, track down the Mr. Bannock Food Truck, Vancouver’s first indigenous food truck. 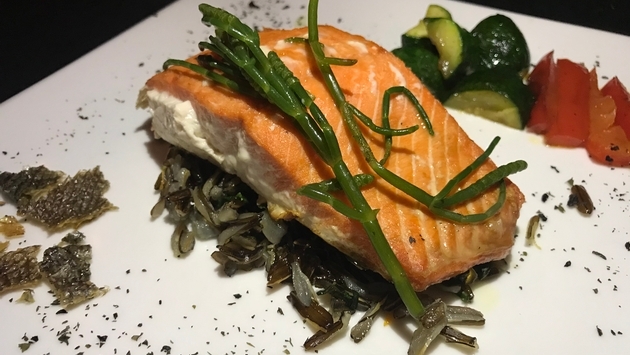 It offers cuisine using ingredients from the Squamish Nation such as juniper berries, smoked wild salmon and meats and prepares it using traditional methods such as clay and stone baking. You can’t go wrong with one of Mr. Bannock’s award-winning Indian tacos topped with venison chili, cheese, salsa and sour cream. Once you’re full, take a break and explore one of the many museums and art galleries that serve as important vehicles conveying the history, culture, stories and messages of the First Nation to visitors and locals alike. Explore Vancouver Museum’s Haida Now exhibit which boasts over 450 works of art, some dating back to 1890. 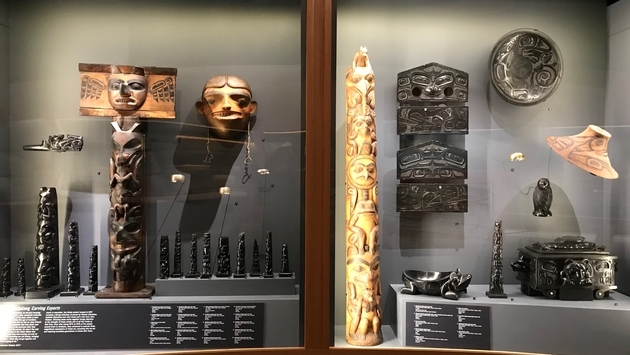 Learn about the importance of First Nation stories, how things like jewelry is used to pass on knowledge and ways Haida artists engage with the world through their craft. Another fascinating body of work to check out? Body Language: Reawakening Cultural Tattooing of the Northwest at the Bill Reid Gallery. This is the first exhibition that fully dives into the world of Indigenous tattooing, piercing and personal adornment. Learn about the history of these traditional practices and find out how they’re used to tell personal stories, create identity and symbolize protection, healing and more, in the present day. Worldwide travel retailer Flight Centre have been experts in travel for over 30 years. With this experience, the company knows exactly what to look for in order to create a memorable holiday. In recent years Flight Centre has noticed a shift in travellers not just looking for flights and hotels, but also unique tours and experiences. 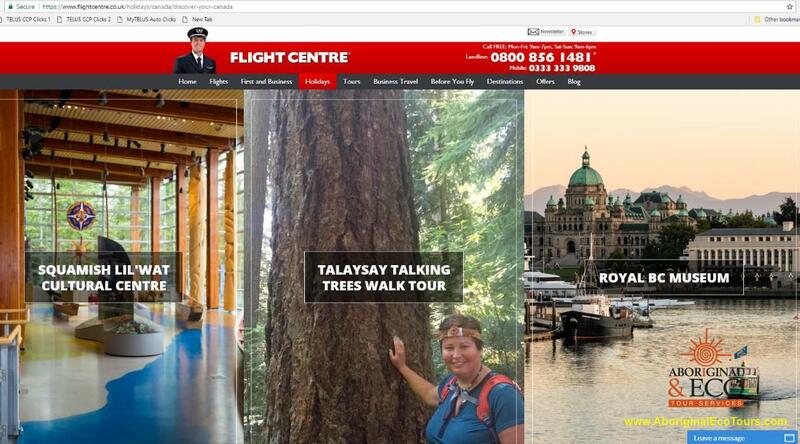 In line with this trend, Flight Centre has identified the Talaysay Talking Trees Tour at Stanley Park as one of the highlights of their Discover Your Canada guide. The tour takes visitors on a 2 kilometres, 90 minute walking discovery through first nations’ culture and the beautiful and conveniently located landscape of Stanley Park. As the Moroccan scholar Ibn Battuta stated "Traveling leaves you speechless, then turns you into a storyteller." And who better to leave you speechless than Candace Campo, member of the Shishalh Nation and owner of Talaysay Talking Trees Tour. A person who has worked with the elders of her community since she was a teenager and has conducted ethnographic research on the topics which are the subject of this experience. 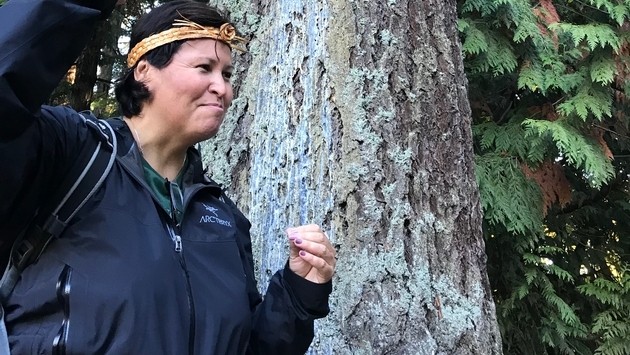 Her skills as a trained schoolteacher and anthropologist position her perfectly to educate visitors about first nation’s medicines, food and way of life within the forests of the North West Coast. Stories such as the explanation of the importance of the "tree of life," – the Red Cedar Tree – which is so important to the first nations' people, will quickly turn travellers into storytellers and advocates for first nations' people and the area in which they have operated for millennia. 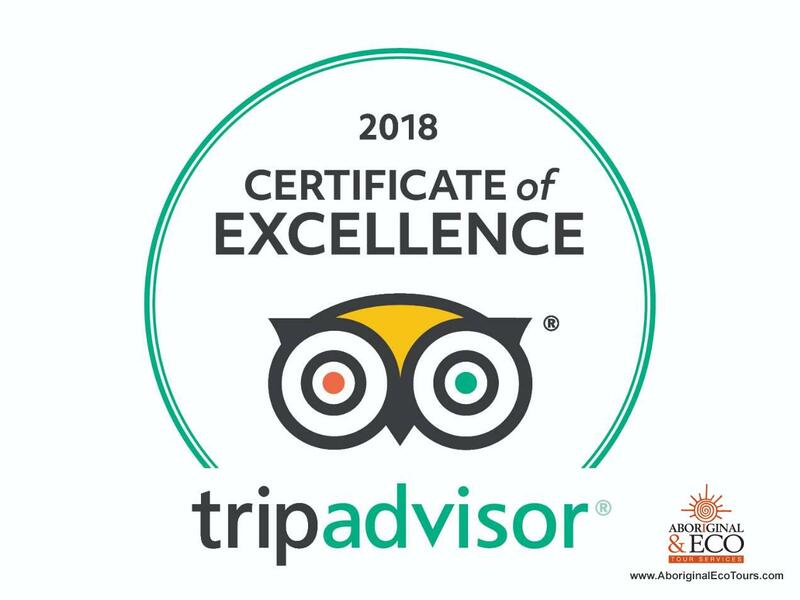 This experience embodies both old new notions of travelling to meet the needs of the modern discerning traveller in a fun, rewarding and educational way which, importantly, is accompanied by a hot cup of traditional indigenous tea! We invite our Sunshine Coast friends, family and visitors to join us for A Night at the Longhouse Event. This is a community cultural celebration and performance with an evening of traditional Coast Salish-shíshálh drumming, singing and dancing and traditional storytelling. Thank you for your participation and interest in our A Night At The Longhouse Event. This event is fully sold. This event is a Canada 150 Celebration in recogition of the resilence of First Nations People who have endured and survived the impacts of Canadian colonial policy and practice. This event is a cultural celebration above which we invite our guests and fellow citizens, the Sunshine Coast residents and visitors, to our sacred longhouse, the communal home of the shishalh people, to celebrate culture, community and our shared future. A Night At The Lonhouse is a fully catered salmon feast with a vegetarian/gluten free option. Advance notice of any dietary needs are appreciated and we encourage you to book in advance so that you can join us. 5:00 pm Doors Open - Come early and warm up the drum and sing with us. 6:15 pm to 7:45 pm – Cultural Performance – drumming, singing and dancing. Menu: Traditional Bbq smoked salmon, wild game, herb roasted potatoes, green salad with blackberry vinaigrette, infused fruit and berry water, dessert, coffee, traditional labrador tea. What to bring: we suggest a blanket to sit on. A reusable water bottle with water. This event is hosted by Talaysay Tours, Candace and Larry Campo of the Shishalh & Squamish Nation. We thank the Shishalh Nation for the generous use of the longhouse facility and we recognize and thank our elders and family for their teachings. Kindest regards, Candace Campo, xets'emits'a.